The Remington 700 is the most popular line of rifles ever manufactured. The rifle was first manufactured in the early 1960s with many of those rifles still in use today and many available in used gun shops across the U.S.
Remington still aggressively manufactures and markets numerous models of the 700 from the basic SPS to long range extreme condition models. 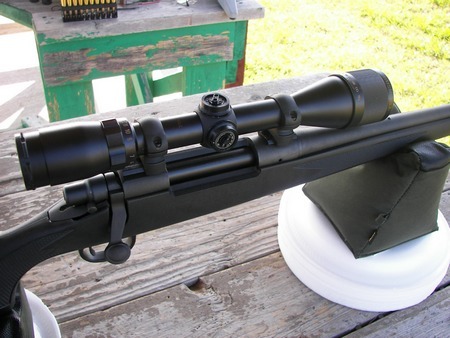 The basic Remington 700 is the SPS which is a replacement for the ADL synthetic stock, with black matte finish. The model I bought is an ADL (now discontinued) which is found abundantly in pawn shops and gun stores. I found my Remington 700 ADL in .270 caliber at Cooper's Gun Shop in Fort Smith, Arkansas. I looked at several calibers of the Remington 700 ADL and other older wood stock models in everything from .243 to 300 Win Mag. I seriously considered both the .7mm Win Mag and the 30-06. But when I picked up the .270 they had on the rack with a Bushnell Banner wide angle scope, I really took a hard look. The gun showed no signs of being owner fired. It was in just out of the box condition as was the scope with absolutely no signs of use. The gun and scope appeared to be something that somebody got as a gift and went and traded or pawned without using it. The bolt face was matte black as is the rest of the gun and was unmarked (meaning likely unfired, except at the factory). My recent acquisition of the Marlin 917 whet my appetite for a larger caliber, harder shooting gun for longer range destruction of melons and Diet Mountain Dew. And when I did a little study of the .270 caliber about which I knew nothing, I found that it is one of the most versatile loads available. 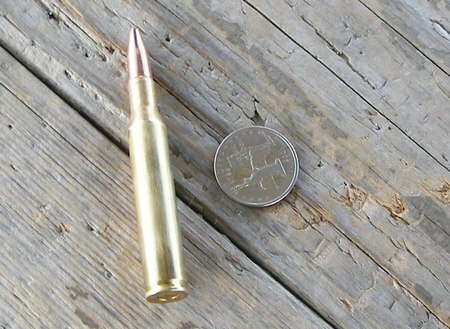 There are factory cartridge bullet weights available from 90 grain to 180 grain. I also found out that it performs similarly to a .7mm Win Mag and 300 Win Mag out to 1000 yards. The out of the box ammo available for it is also less expensive and the load results in less recoil. What's not to like about this thing? So, I made my decision and laid down the $399 plus tax for this mint condition rifle and scope and took it home. As I do with all firearms, the first thing I did was clean it. There was no residue of any kind on the bolt or action, further confirming it's non-use. The only thing to clean out was the barrel which gave up some kind of what appeared to be light green grease from the barrel which quickly cleaned up with Remington Gun Scrubber and Hoppes #9. At the Old Fort Gun Club, I took the Remington 700 ADL out of it's new Academy Sports vinyl case and took a few pictures of the gun before firing it. The first picture shows the firearm from the left, set on the sand bags that would be my firing platform for it's test. Note the Bushnell Banner Scope which I will write about more below. My first time at the range would be dialing the scope in and getting maximum accuracy under actual shooting conditions (not from a stationary stand). I wanted to see what I could do with the rifle supported, but not stationary or clamped down, so I used the sand bags and did the shooting with a normal grip on the rifle. The action is one that you will find on all Remington 700 rifles. They are bolt action, with a trigger that varies in pull weight according to which model you own. But they are user adjustable or adjustable by a gunsmith for a minimal cost. The Bushnell Banner Wide Angle 3x40 scope is an inexpensive scope, but is known as a “best in class” for this price range. The price of one of these new is around $80 - $100. Most “real shooters” would sneer at a scope in this price range. We'll see what it gets done below. This one, as most of these scopes are known for is their bright, clear optics and durability on center fire rifles of all calibers. 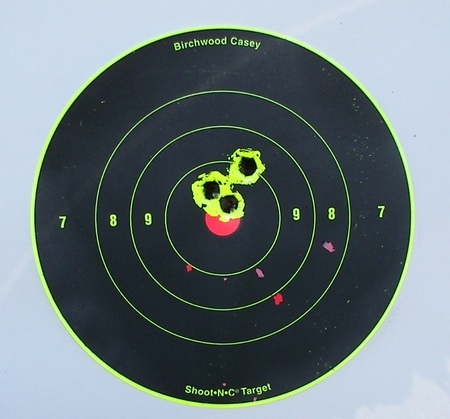 The first thing I did with the Remington 700 ADL .270 was just fire one bullet at the center of an 8”x8” target just to see where the 130 grain Remington Core-Lokt bullet was going. Because of the size of the bullet case, I braced myself for a pretty substantial recoil, but was surprised by a pleasant and satisfying shot. It was not the least bit what you would call “hard”. It remained pleasant to shoot throughout my range time. Contributing to this is a nice recoil pad that aided in keeping my shoulder protected. The first shot went about 5” wide and 3” high. It was there I began my journey to get max accuracy from this gun at 100 yards. I went to work on this Remington 700 ADL/Scope combination with a good deal of research knowledge on what to expect. As expected, I was all over the place on the target while getting the scope and rifle dialed in. 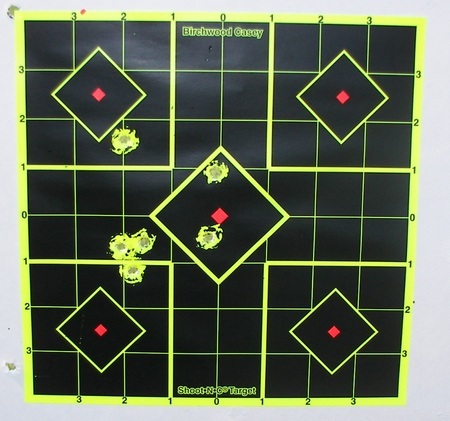 Finally I knew I could, with 100% correct shooting procedures, hit what I was shooting at, get some tight groups. I knew to demonstrate the rifle's capabilities in a three shot group, I would have to do three perfectly performed shots. I would concentrate on every facet of the rifle shot, which does not come naturally to me. So, I fired three shots, agonizingly concentrating on each facet of the shot: scope eye relief, breathing, stability, trigger ssssqqquuueeeezzzeee..........boom! Three shots. There they are below. Now, considering that this gun was not in a stationary rest, was in the hands of an infrequent rifle shooter, and I challenge anybody with any rifle/scope combination to get better than that out of it. Can they do it? Yes. But very little. And the difference would be an expert shooter and thousands of dollars in added cost. Necessary? Not in my world. Bottom Line: I'll be setting the gun up for targets out to 300 yards because that's as long a range as I have to sight in a rifle. And in Arkansas, there are not vast, dessert places to shoot animals at 1000 yards. But this rifle and scope at $399 proves that those of us who are regular people who love to shoot can have an affordable, remarkably accurate rifle. One that will fill the need of everything from plinking to competition, to putting food on the table. And keep in mind that the durability of these remarkable firearms is evident in the numbers of them over 30 years old that are still in use. 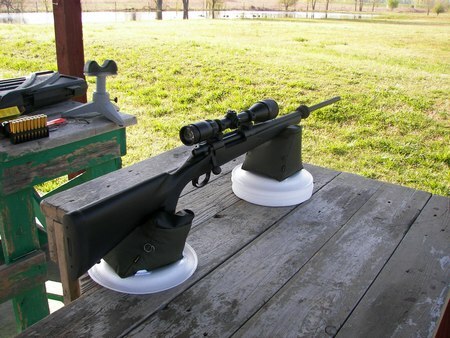 Remington 700. The most popular rifle in the world......for under $500. UPDATE: Over 3 years after the original article above, the Remington 700 ADL is still with me, still providing tons of fun shooting. Still accurate with the cheap Bushnell scope. The .270 in this model is a great all around shooter for everything except the largest game animals in North America. Even young kids shoot this thing and don't mind the recoil. Plus, they hit what they're shooting at and get to watch it splatter 50 feet in every direction. A winner of a gun and a great buy. UPDATE: 2017 The rifle is no longer with me, but it was used as a range gun for about 6 years, shooting a total in those times, more than most hunters will shoot their rifles in a lifetime. When I sold it, the scope had never been removed from the rifle, and never been adjusted from the initial review. Still sending rounds right to the center of the target at 100 yards. If I decided to become a hunter, some version of the Remington 700 would likely be one of my first choices for a primary rifle.